The rent at EVIVA Midtown Apartments ranges from $1,989 for a one bedroom to a $3,388 two bedroom. Apartments in this building are about 49% more expensive than the Downtown average. This is a pet-friendly apartment. EVIVA Midtown Apartments is a seven minute walk from the Blue Meadowview - Watt/I-80 and the Gold Downtown - Folsom at the 16th Street Station (WB) stop. This apartment is in the Downtown neighborhood in Sacramento. Nearby parks include California Vietnam Veterans Memorial, Fremont Park and Capitol Park. 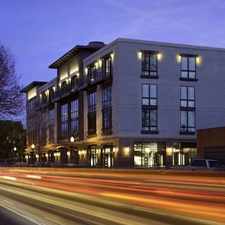 EVIVA Midtown Apartments has a Walk Score of 90 out of 100. This location is a Walker’s Paradise so daily errands do not require a car. EVIVA Midtown offers Studio, 1 and 2 bedroom apartment homes in the heart of Downtown Sacramento. All of our well-designed floor plans are spacious offering luxury features such as stainless steel appliances, quartz countertops, subway tile backsplashes, and plank-style flooring. Walk. Run. Bike. EVIVA is within half a mile of over 100 restaurants, 50 bars, and 18 coffee shops. Additionally, our residents enjoy our amazing amenities, including a 24 Hour Precor fitness center, community lounge with entertaining kitchen, fire pit, BBQ with food prep area, package concierge, and Valet Waste service. Please call for an appointment today. Explore how far you can travel by car, bus, bike and foot from EVIVA Midtown Apartments. EVIVA Midtown Apartments has good transit which means many nearby public transportation options. Car sharing is available from RelayRides and Zipcar. 1531 N Street compared to all of Sacramento. How do you feel walking near 1531 N Street? EVIVA Midtown Apartments is in the Downtown neighborhood. Downtown is the 2nd most walkable neighborhood in Sacramento with a neighborhood Walk Score of 92.